Bloomberg New Energy Finance released its latest New Energy Outlook report for 2018 and it’s good news for the renewable energy industry, with wind and solar expected to grow to almost 50% by 2050, coal to shrink to 11% of global electricity generation, and batteries to increase in popularity as prices plummet. Published on Tuesday, Bloomberg New Energy Finance’s (BNEF) New Energy Outlook (NEO) 2018 is its annual long-term analysis of the future of the global electricity system and is based on detailed research from a team of over 65 analysts from around the world. While this year’s NEO brings good news for the wind and solar industries — forecasting they will account for almost 50% of world electricity generation by 2050 — the 2018 NEO is the first to highlight the dramatic impact of falling battery costs and the impact this sector will have on the electricity mix over the next few decades. 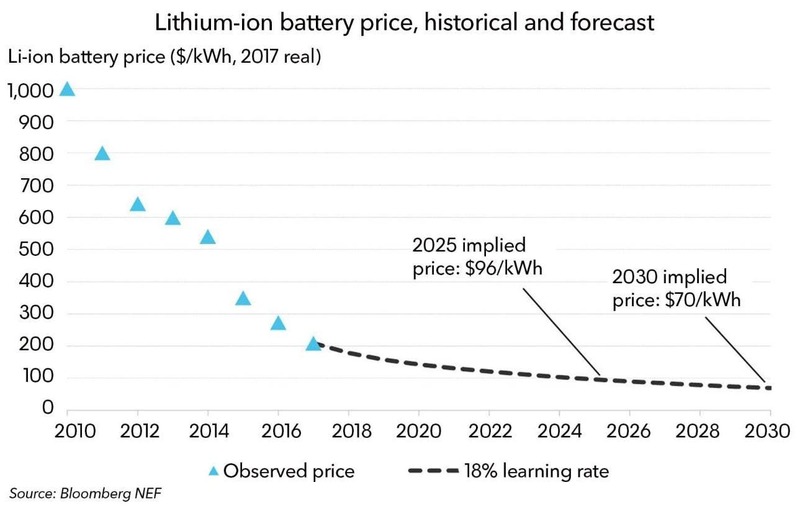 Specifically, BNEF predicts that lithium-ion battery prices — which have already plummeted 80% per megawatt-hour (MWh) since 2010 — will only continue to tumble as the electric vehicle sector continues to build through the 2020s. The report also highlights an expected $11.5 trillion being invested globally in new power generation capacity between 2018 and 2050, of which $8.4 trillion, or 73%, will go towards wind and solar, and a further $1.5 trillion towards zero-carbon technologies such as hydropower and nuclear. For the solar industry in particular, BNEF is predicting a 17-fold increase in capacity globally and the levelised cost of electricity (LCoE) will fall a further 71% by 2050, having already fallen by 77% between 2009 and 2018. The wind industry will benefit from a sixfold increase in capacity and see its own LCoE fall a further 58%, from the 41% decrease seen over the previous decade. Further good news, as Elena Giannakopoulou, head of energy economics at BNEF, explains it, is the fact that “Coal emerges as the biggest loser in the long run. Beaten on cost by wind and PV for bulk electricity generation, and batteries and gas for flexibility, the future electricity system will reorganize around cheap renewables – coal gets squeezed out.” Further, NEO 2018 predicts that coal burn in power stations will fall by 56% between 2017 and 2050. Natural gas will unsurprisingly remain a strong player, but according to BNEF will undergo a transformation from providing base-load power to back-up power for renewables. Bloomberg predicts $1.3 trillion to be invested in new natural gas capacity through to 2050, with nearly half of that for ‘gas peaker’ plants rather than for combined-cycle turbines. Gas-fired power generation is forecast to increase by 15% between 2017 and 2050, but its share of global electricity will fall from 21% to 15%. Natural-gas burn will increase by 14%. 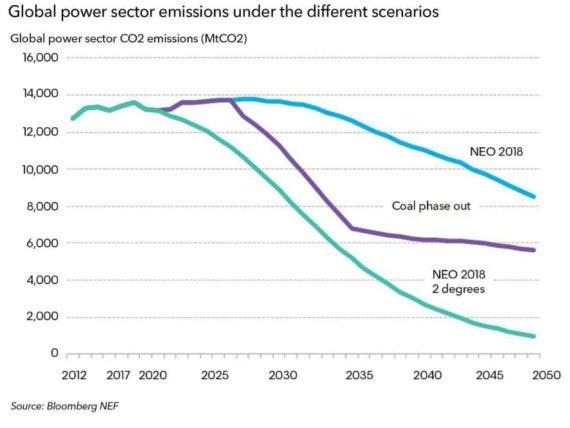 Further, BNEF predicts that the global electricity sector will see its emissions increase 2% from 2017 to a peak in 2027, and then falling by 38% by 2050. Unfortunately, this still means that the electricity sector will fail to fulfil its part of the effort to keep global CO2 levels below 450 parts-per-million (PPM) — the level equivalent to a rise in global temperatures of only 2 degrees Celsius.